← The BBC discovers Norton! Half way through the excavation and we’re nowhere near where I’d hoped to be by this time. I’d intended that we’d have finished Trenches II and III by this stage but we haven’t even completed a single feature in either. Given the weather forecast, it’s unlikely that we’ll get any completed today (and tomorrow looks like a complete washout); but we absolutely do need to get some of the features in Trench I excavated otherwise the project has failed. I ought to have given up on sieving earlier; I ought to have made people dig more rapidly; I ought to have asked for more people… Nevertheless, we have demonstrated that there was never a mound at the centre of the “double ring ditch” and that we can be 90% confident that it actually is a henge, so I suppose that it’s a bit harsh to say that we risk failure. After yesterday’s BBC Three Counties Radio interview, we’ve got Jack FM coming in this morning and BBC Look East on Friday. I gather that Three Counties Radio would like to do a follow-up on site tomorrow, but I believe that the weather is likely to be foul, so there may well be nothing happening here. But we do seem to be getting good publicity: hedges aren’t that common as monuments, so they arouse interest, especially in view of recent excavations at Stonehenge, Durrington Walls and Marden. All the features in Trenches II and III are beginning to look thoroughly Romano-British. This probably means that we can stop 3D finds recording after lunch, which will speed up the excavation. By 2 o’clock it had started spitting with rain. While it remains light, we will continue digging as we are so far behind schedule that I don’t want to lose any more time than we have to. Should it start to pour (as seems inevitable), then we’ll have to call it a day. The northern half of the site is beginning to look entirely Roman. 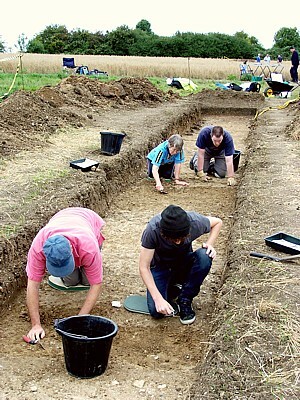 We seem to have field boundaries in Trench III, towards the top of the slope and something more complex in Trench II. 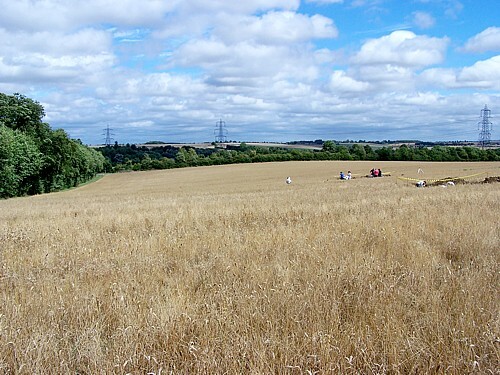 This could mean that the enclosure suggested by the geophysical anomalies is the site of a farmstead; earlier, I picked up some Roman pottery, including a sherd of amphora, from the field surface to the south of Trench II. By 3.15, the rain had become heavier so I decided to pack up. I’m worried about tomorrow’s weather as the forecast is awful. 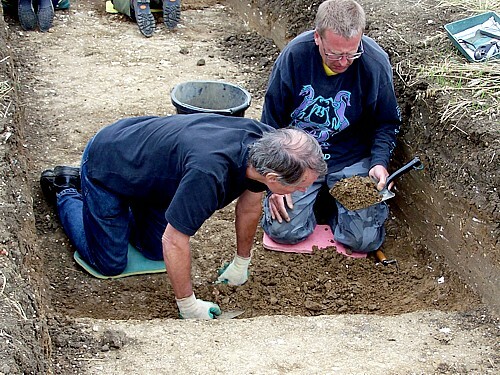 Posted on 25 August 2010, in Fieldwork, Stapleton's Field Dig 2010. Bookmark the permalink. 1 Comment. Stop blaming yourself! Progress is only slow because you’ve found so much, and dealt with it so meticulously – and correctly of course. How awful if you had rushed and skimped and made a rotten job of it.